Many of our visitors are technically qualified persons or persons interested in “Do it yourself” type of solar projects. So, if you don’t want to hire a technician or if you want to install your simple solar panel setup for your home by yourself, it is better to buy solar panels online. Solar panels are available at different price range; quality of panels also differs according to the price. In my experience, I would recommend Ebay india site to buy affordable solar panels with better quality. No need to panic, Chinese solar panel manufacturers are the leading companies in solar panels sector worldwide. 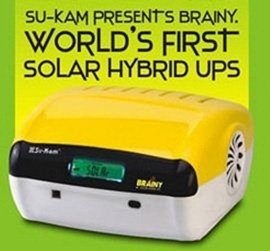 If you want long term warranty, just go for branded solar panels like Tata solar, Moser baer , Sukam, Luminous etc. These panels are little expensive than Chinese panels but you will get 10 to 15 years warranty for sure. First you need to register with eBay, make sure you submit correct Name, Postal address and phone number during registration. Both 12 volt and 24 volt panels are available; you need to pick the right one the suits your requirement. Choose 12v panels, if you want to add solar panels to your existing single battery inverter. Choose 24 v panels, if you have double battery inverter. Check the feedbacks received by the seller, if you find so many negative feedbacks, better you avoid that seller. Choose the best seller who offers best price and quality; make payment through net banking, debit card or credit card. Don’t worry it is very safe, I have tried it so many times and I recommend it. If you are from the same city of the seller, just choose cash on delivery option, you no need to pay online, just place your order with correct address, the product will be delivered at your doorstep. You check the product and pay! COD is Very useful option for buyers from cities like Chennai, Hyderabad, Bangalore, Delhi and Mumbai. What if I receive solar panels in broken condition? The chances are minimal, courier companies will handle this stuff with great care like LCD and LED TV’s, so no need to panic. I am sure you will get full refund to your bank account with in 10 to 15 days. I find no other online shopping site with such fair e-guarantee policy; I recommend ebay.in for buying solar panels, charge controllers and other accessories for solar panel installation in your home.